Andrew and I have started exercising again! We finally agreed on the days of the week to get outside after work, and for the past three weeks we've been sticking to it. I try to be optomistic, generally, but because we've stopped and started in the past, I'm not sure how long this will last. On the days we exercise, my routine is to prep a few things for dinner before we run so we aren't waiting too long to eat after we get back. My favorite dish is the kind I can pop in the oven while we're out, and these peppers fit the bill. They're hearty and filling, which is great for refueling after a workout, and not even a carnivore will miss the meat in this dish. Serves 4, or 2 with leftovers. If you like more heat, add a second jalapeno to the sauce, or finely chop one to add to the stuffing. Serve with lime wedges and sour cream, if desired. Preheat oven to 425. In a blender, combine tomatoes in puree, jalapeno, half the onions, and 2 whole garlic cloves; puree. Season with salt. Pour sauce into a 9-by-13-inch baking dish; set aside. In a medium bowl, combine beans, cornmeal, 1/2 cup cheese, remaining onions, minced garlic, cumin, and 1/2 cup water; season with salt and pepper. Dividing evenly, stuff poblano halves with bean mixture; place on top of sauce in baking dish. 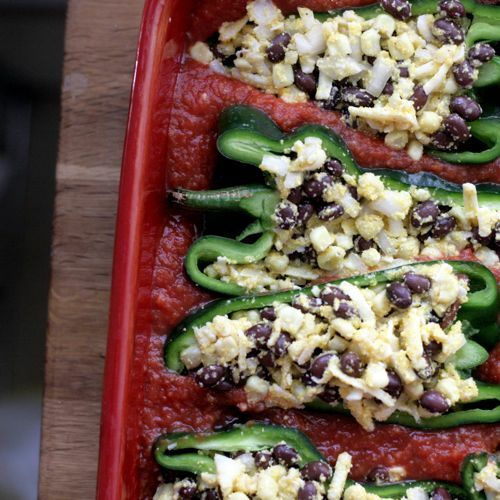 Sprinkle poblanos with remaining 1/2 cup cheese; cover baking dish tightly with aluminum foil. Bake until poblanos are tender, about 45 minutes. Uncover, and continue to cook until sauce is thickened slightly and cheese is browned, 10 to 15 minutes more. Let cool 10 minutes.